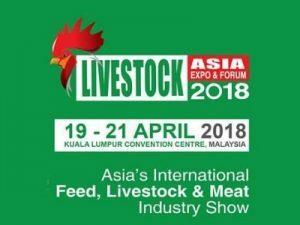 LIVESTOCK ASIA Expo & Forum has developed an outstanding reputation since 2001 as Asia’s leading event for the feed, livestock and meat industries. Asia’s International Feed, Livestock & Meat Industry biennial show will return to Malaysia and continues to grow bigger and better each time. Supported by the Department of Veterinary Services, the Ministry for Agriculture and Agro-Based Industries the event is expected to attract more than 7,000 local, regional and international trade visitors and delegates, representing integrators, veterinarians, livestock farmers, feedmillers, wholesaler, retailers, food processors, importers and distributors. Livestock Asia has developed an outstanding reputation as Asia’s leading event for the feed, livestock and meat industries since 2001. In 2018, Livestock Asia and its co-located events ASIA MEATEC and AQUACULTURE ASIA 2018 Expo will welcome over 7,000 delegates and visitors and more than 200 exhibitors from 20 countries. Led by international pavilions from the China, Korea, and Taiwan will bring a strong international perspective to the region’s livestock sector. Moreover, it also encourages valuable business partnerships, knowledge transfer and investment by which we can help to increase the region’s competitiveness by further improving the quality and safety of feed, livestock and meat products.